With the advent of the digital era more and more companies move their processes and working environments into digital platforms. In this transition of the corporate world, there has been a stopper that prevents the full automation of the internal processes of companies: manual tasks, legacy systems and calculations made on static files. A recent trend in technology that tackles this stopper is called Robotic process automation. RPA, as it is known in the industry, is the notion of automating repetitive or manual tasks by using robots or artificial intelligence (AI) workers. Bizagi features a section on the Expert view that allows to configure different types of Bots or connect to existing ones (that could also be programmed by you to do a specific task) from different vendors. Through this section we are going to discuss what RPA is and the world of possibilities it opens, especially when using it from Bizagi. As briefly stated before, RPA stands for Robotic Process Automation. It is used to automate a set of actions by "watching" a person doing the procedure on a GUI (graphical user interface) and once the procedure is finished, the programmed Bot will be able to recreate the actions any time that it is asked to do so. RPA bots can receive parameters, which in turn they can use to populate information required by the specific procedure that it was configured to perform. An important characteristic of RPA is that it is used to automate complex, rule-based work, which means that it allows developers to program a robot to perform a task the way a person would. This may sound familiar to traditional scripting or definition of a list of actions to be performed by the usage of APIs and Operating System resources. And to a point it is, though with RPA you can do what traditional scripting allows, but you can go even further by automating procedures that for their nature cannot be triggered by using APIs. This means that tasks that had to be executed manually, like consulting information from a legacy system or console applications, making searches in GUIs, filling forms and others, can now be programatically performed. •Reducing the time it takes to execute a process from its starting point until its last activity. •Cost efficiency and employee productivity by avoiding the need of technical workers performing manual tasks, allowing employees to focus on the tasks that really matter. •Reduces the probability of errors by taking humans out of the equation. It is normal and common for technical workers to commit errors when performing manual tasks. •The scale of projects that a company can perform increases. •With moderate development efforts a big impact can be achieved. Since with RPA you can emulate the way a person executes a procedure using a GUI on a computer, the possibilities are uncountable. An RPA robot can be tailored to perform virtually all of the tasks a person can do, so this means that the limit of what can be done with it is the creativity of the developers programming the robots and the necessities of your business scenario. •Financial day/month closure (conciliation procedure). •Periodic static report construction and sharing. •Automated testing of GUI applications. •Loan processing (risk assessment from provided documents). •Automation of sales operational activities. •Creation and delivery of invoices. How can you leverage RPA's power from Bizagi? 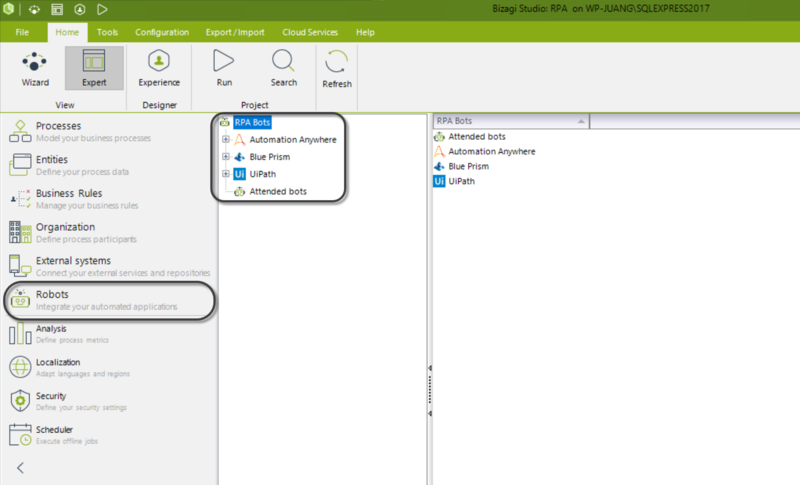 There are two different ways that Bizagi can be directly integrated with RPA. Bots like the UIPath Bot let you to connect Bizagi to an existing Bot programmed and available on UIPath's platform. This means that you can use Bots previously programmed to perform a specific task available on UIPath's marketplace or you can even program your own UIPath Bot to do a task that is unique to your Business scenario. These Bots are configured from the Expert view in Bizagi Studio, and the way they work is very similar to that of a connector. You just have to specify the connection details to the Bot, the input parameters and map the output parameters to your Data Model's attributes; each time the moment comes that the Bot is invoked, it will perform the task that it is programmed to do and yield the results of the task to your Bizagi Process. There are many vendors of RPA and we are currently working to support the leading ones so that you can also use the Bots created on those platforms directly from Bizagi. •Case creation upon the arrival of an email. •Reading information from a PDF and inputting it to a Bizagi form. •Clicking next on an activity. •Reviewing and approving/denying requests automatically. •Extracting information from Searches and Query forms and building reports from them. •Cancel cases that have been inactive for a long time. •Populate the users list of your Bizagi application (for authentication purposes).